The ruling comes just days after another court in Bavaria ordered a leading anti-mosque campaigner to pay a hefty fine for "defaming" Islam after he repeatedly warned that Islam is incompatible with democracy. On October 18, the Munich-based Administrative Court of Bavaria (Verwaltungsgericht) ruled that it is lawful for the Bavarian branch of Germany's domestic intelligence agency, the Bundesamt für Verfassungsschutz (BfV), to continue spying on anti-mosque activists. According to Herrmann, members of Freedom Bavaria and PI (roughly analogous to American Tea Party activists) are "right-wing extremists, who, under the guise of civil involvement, are increasingly establishing citizen's initiatives to attract the attention of German voters." In this way, Herrmann claims, they are "using the discussion about the construction of mosques, for example, to arouse, in an anti-constitutional way, prejudices against Muslims and Islam." Herrmann told the court that the BfV serves as an "early warning system" by tracking potential threats to the constitutional order. He accused the leader of Freedom Bavaria, Michael Stürzenberger, of engaging in potentially anti-constitutional activities by repeatedly referring to Islam as a "fascist political religious system." By failing to make a clear distinction between Islam and Islamism, Herrmann argued, Stürzenberger was guilty of trampling on the constitutional rights of Muslims. Stürzenberger included a quote from an Iranian exile whose brother was publicly lynched for converting to Christianity. "Islam is going to destroy Germany just as it has destroyed Persia," the Iranian warned. Concluding his blog post, Stürzenberger wrote: "Islam is like a cancer, which decomposes the (still) free peoples of this planet and gradually infects them with the poison of this extremely dangerous, intolerant, misogynistic, violent and power-hungry ideology." Stürzenberger defended himself by arguing that the blog post referred to the ideology behind Islam, and that his words were not directed at Muslims as individuals. He added that he has a duty to warn fellow citizens about the danger of the rise of Islam in Germany. He said that women's rights, democracy and peaceful coexistence are being threatened by the spread of Islamic Sharia law in Germany. In its verdict, the court ruled that by comparing Islam with a cancer, Stürzenberger was guilty of "insulting" and "defaming" Islam and ordered him to pay a fine of 50 daily rates of 50 euros. Stürzenberger said he would appeal the ruling. Moreover, a December 2007 diplomatic cable from the American consulate in Munich revealed that the former Bavarian State Secretary, Georg Schmid, had warned about an internal concept paper for the mosque that proposed a more fundamentalist goal than the one announced publicly. The paper reportedly referred to the need for children to be educated in "pure Islam," and also criticized the way European Muslims were being "to a certain extent compelled" to co-exist with a non-Muslim majority in society. The cable also shows that then Bavarian interior minister, Günther Beckstein, confided to American diplomats that "Idriz plays two different pianos." He was referring to Idriz's practice of portraying himself as a moderate to some audiences and as a radical to others. In fact, for many years the mosque was called the Center for Islam in Europe-Munich (ZIE-M). But in late 2013, it was given a new name, the Munich Forum for Islam, apparently in an effort to dispel growing public unease about the mosque's broader ambitions. 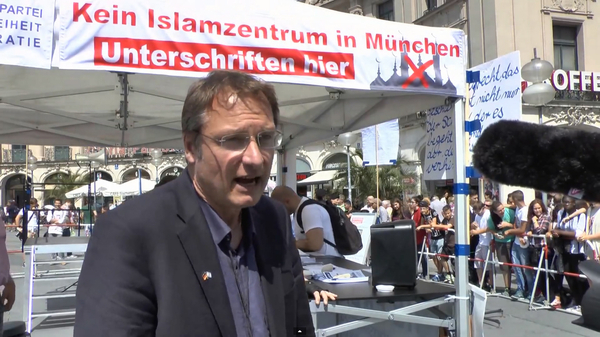 Munich Mayor Dieter Reiter, from Germany's center-left Social Democratic Party (SPD), said that if the public referendum were permitted to proceed, it would give Stürzenberger's anti-mosque campaign "a democratic veneer, which we want to avoid." "To all those Munich citizens who supported the referendum with their signatures, we would like to encourage you to familiarize yourself with the City Council resolution and its extensive legal justification. Then you will realize that the referendum is not a legitimate right conferred by a democratic institution, and that by stopping the vote from going ahead, the City Council is preventing your opinion from being abused by the anti-democratic goals of extremists." Stürzenberger says the Munich city council's efforts to silence dissent are similar to the tactics used by the former Communist dictatorship in East Germany. He has vowed to fight the city council in court.